Conceptis Maze-a-Pix are exciting maze puzzles that form whimsical pixel-composed pictures when solved. As the player paints the path from the entry to the exit of the maze, a “hidden” picture is exposed. Discovering a beautiful picture makes the traditional maze concept more rewarding and fun to play. Conceptis Maze-a-Pix puzzles offer a wonderful mix of logic, art, and fun, while providing solvers with many hours of mentally stimulating entertainment. Mazes are amongst the oldest and most popular type of puzzle ever known. The original concept of picture mazes which led to Maze-a-Pix puzzles was invented in Japan over 20 years ago. Since then manually created picture-forming mazes became popular in Japanese puzzle magazines published by Gakken, Nikoli, Sun and others. In 2004 Conceptis developed a computer algorithm which converts pixelated pictures into mazes. Thus, Conceptis became the first company in the world able to create high quality picture mazes in large quantities and at reasonable prices. 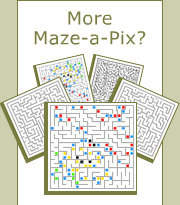 In June 2004 Conceptis announced Maze-a-Pix, a maze puzzle that forms pictures when solved. Maze-a-Pix puzzles from Conceptis are available in many sizes from small mazes of 25x25 squares targeted at kids and up to colossal poster mazes of 200x200 which are suitable for adults. Maze-a-Pix puzzles require no special rules or learning and are solved exactly the same way as traditional mazes. In September 2005 the first two books dedicated to Maze-a-Pix puzzles were published by Sterling Publishing in the USA. Named Picture This! Mazes and Hidden Picture Mazes, each book contains 96 pages in a 5 3/8” x 8 1/4” format and are available online at Amazon and Barnes & Noble as well as other fine stores throughout the USA, Canada, and the rest of the English-speaking world. In March 2006, Kururinpa, a mobile game based on Conceptis Maze-a-Pix puzzles, was released by G-mode in Japan. To play Kururinpa, users rotate the maze using joystick buttons to make a rolling ball draw the path inside the maze. When this arcade-like puzzle is solved, the path changes into a beautiful colored picture. In April 2006, two additional Maze-a-Pix books named Picture That! Mazes and Super Hidden Picture Mazes were published by Sterling Publishing. The company is continuing to publish 4 new Maze-a-Pix books each year. Today, magazines with Maze-a-Pix puzzles by Conceptis are published regularly in 35 countries including USA, Japan, the UK, Germany, Netherlands, France, Russia, Denmark, Israel, Hungary, Austria, Spain, Norway, Sweden, Switzerland, Belgium, Italy, Australia, New Zealand, Czech Republic, Brazil, Turkey, Korea, Thailand, Romania, Estonia, Latvia, Peru and more.